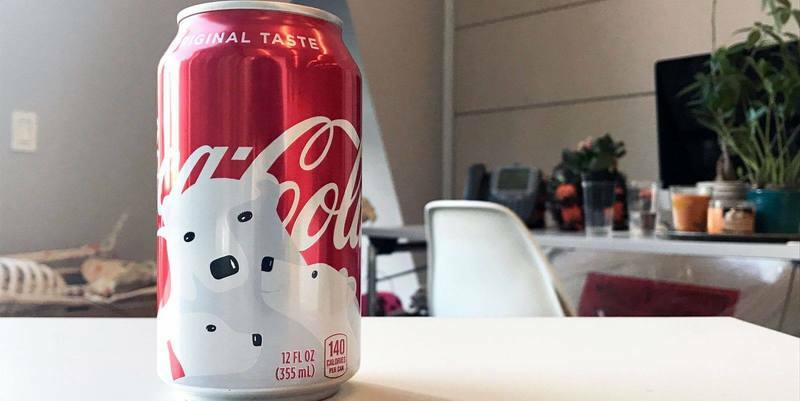 The iconic Coca-Cola polar bears make another adorable appearance on the new holiday cans this winter season. However, there is more to the polar bear design than meets the eye. Other brands, like Hershey’s, are known to incorporate hidden symbols in their logos and it seems like Coca-Cola is following the trend with a play on its classic polar bear design. “Reddit user sunkist268 first noticed that the limited-edition cans hide parts of Coca-Cola bottles inside the bears themselves,” reported Delish. But you might need a magnifying glass to see the details of the polar bear design. Upon further inspection of the festive cans, it’s easy to see that the polar bears' eyes and eyelashes are actually upside-down bottle caps and the spot where the light hits the polar bears' noses are silhouettes of the classic glass Coca-Cola bottle. The Atlanta-based beverage company has been incorporating polar bears into its product design since 1922. The new 2017 design was created by illustrator Noma Bar as a way to incorporate the signature polar bears into a universal holiday can that could be distributed throughout the world. Coca Cola’s design director Frederic Kahn also hinted at other symbols that can be found on the limited-edition holiday cans.